Michael B. Jordan, 31, is on the cover of this month’s issue of GQ, in which he is profiled as one of their Men of the Year. MBJ’s interviews are pretty formulaic: the interviewer talks of his innate charisma or warmth, mentions his impossible smile, and likely meets his parents because MBJ still lives in a home with his family. Eventually he makes his way to talking about how Denzel Washington is his role model, though he ultimately wants to be an actor on par with Leonardo DiCaprio and Brad Pitt, his ambitions unsoiled by racist typecasting or strictly “black” roles. He insists, I mean insists, that he’s not dating anyone, ever. Another topic the puffy-cheeked hunk has contended with more than once is the pesky rumor that he doesn’t date black women. Speaking to GQ in relation to the rumor he says: “Like, damn. Of all the places that I’m getting this, it’s coming from here?” He also addressed the matter in his Vogue 73 questions video, saying it was one of the weirdest things he’d ever heard about himself. The rumor has its roots in the murky annals of the internet but also, somewhat, in his own dating history, which has skewed rather... beige. This is a not-even-sly bid to maintain his universal appeal and not piss off a contingent which he knows is a large part of his horny fan base. I, a black woman, would like the world to know that I do not care at all whether Michael B. Jordan dates white women. 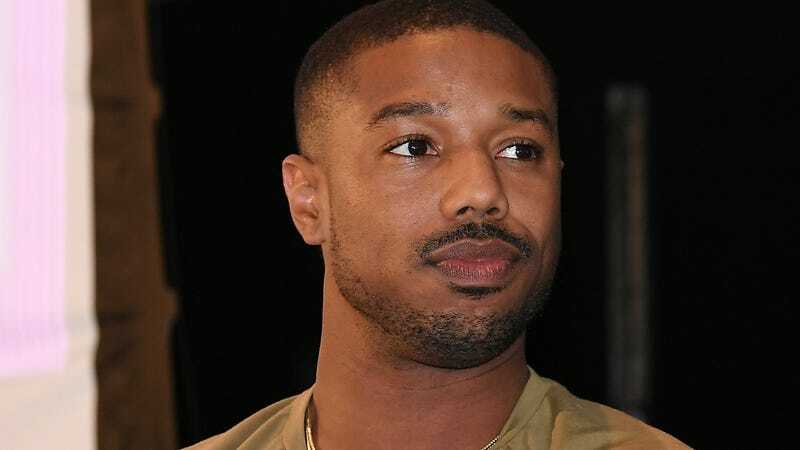 What I want to know is why was the movie Creed seemingly six hours long, with no intermission, and why is the film’s climax MBJ’s character losing a fight? I saw the film in theaters that winter, and I confess to frequent micro naps throughout the production, but everytime I was awake, he was either detangling someone’s hair or losing a fight. Maybe I should rewatch? Rob Kardashian, father of baby Dream, is apparently filing to have his child support payments lowered, due to the fact that baby mama Blac Chyna, is worth more than he is these days. Rob had been ordered to pay $20,000, a figure he insists he can no longer afford, and he claims that the restraining order Chyna obtained against him last year caused him to suffer financial losses. He previously sold socks, as well as starred in a reality show with Chyna, which has halted production. Rob is actually petitioning to have Chyna pay him almost $3000 a month, as her income eclipses his own. I’m sorry that Dream’s parents are fighting but I am excited for the beautiful array of professional wigs Chyna is bound to display during the legal proceedings.